Upgrading from iOS6, lost all of my content! Discussion in 'iOS 7' started by Dsella, Aug 31, 2013. I just installed Beta Build 6 of iOS7 on my phone upgrading from iOS6. I recently built a new desktop, and my backups of my phone have been on my laptop that I was using before. On this desktop, I did not have a backup file of my phone prior to installing iOS7. Once the iOS7 installation was complete, I noticed that I had nothing on my phone. I quickly realized that this was the problem..
What I need to know is this - How can I use my backup file from my laptop to get all of my stuff onto my phone now that it is iOS7? I look forward to using this forum! Quite intriguing all of the threads and information that can be obtained through here! Why don't you restore from iCloud? My iCloud is full & not everything has been synced there. I would only have a chunk of everything. Also - I'm not entirely sure what my iCloud login is! I could have bet $1 million dollars that my iCloud and Apple ID for AppStore were the same, but apparently they are not! EDIT: I take that back! Apparently it's working now and using the same information that AppStore uses. I now have all of my Contacts back.. but I still need all of my other stuff such as Notes, Photos, etc. etc. iOS 7 is a beta operating system and expectations to keep your backups should be hedged until the GM starts. If you can't do a restore from iCloud then I'd look at a third party program like phone view to browse your old backups and potentially do a restore. But considering that things may have changed between iOS 6 and iOS 7 this isn't guaranteed way to get your content back. I don't mean this in a condescending way, but any time you are installing any kind of prerelease software do a backup. iOS 7 in its current state will ask you after launch if you I want to do a restore from existing backups in iTunes. I'd also discourage use of a beta mobile operating system as much as possible. Things can and will break and aren't supported or properly documented yet as it's not out for the general public. I hope you are able to get your data back. Definitely take a lesson from this and do backups to either iCloud or iTunes. iCloud is huge easiest way to backup most of this and it's really easy to restore from in a pinch. It did not ask me to do a restore from a backup after the iOS 7 installation was completed, but I suppose that could just be because I didn't have any backup files on this new desktop! Just a tip about iCloud being full, make sure there aren't any large backups in iCloud that you don't need. Go to settings > iCloud > storage and backup > manage storage. It is always best to do a backup before installing a new iOS, however, this can be done via connection to computer using itunes...If you've ever synced with itunes on your computer, you could try doing a restore from backup there, if not, then, you might just be out of luck. These are the kinds of things you need to do before attempting to put a new iOS on your idevice. (manage your icloud so it's not full, do regular backups, etc.). 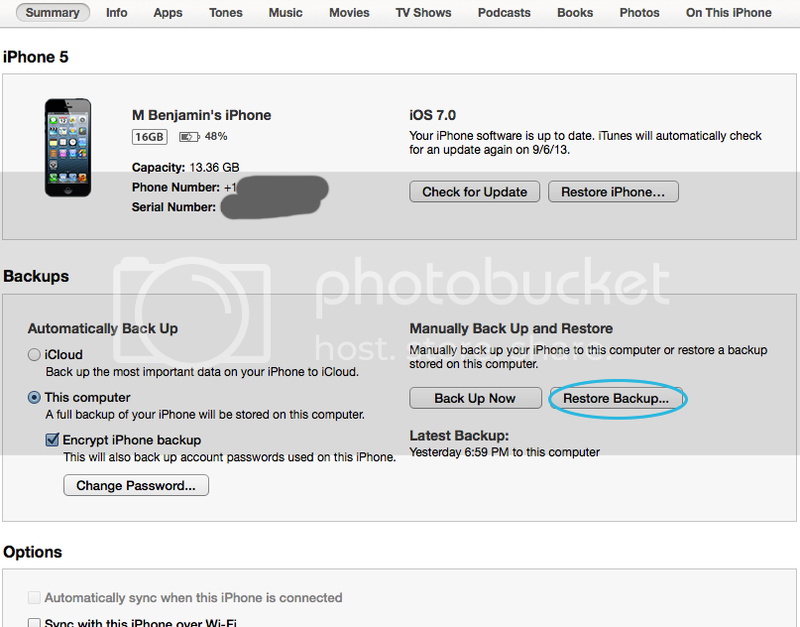 when I say "restore from backup", I mean where it is circled, not from the "restore iphone" option. You should at least be able to put the last backup you have on your laptop onto it. So if I do this option, I can select the back up file when plugged into my laptop and it will just load all of my data and such as well as keep iOS 7? if ure upgrading u shouldnt have lost anything. if i were u- restore to iOS 6, restore from ios 6 backup, option plus click update (if on mac) and that should do it... ive upgraded to ios 7 from ios 6 on various devices like this around 4,5 times and never lost anything. First you would install the iOS, whether it be a newly downloaded version or option-click (alt-click on win) on the "Check For Update" button and pick the version of iOS you want on the phone. Then, after you've installed the iOS, set it up as a new phone. Now go back and do the restore backup and it will put all your apps/data/settings on it. It's a separate function from updating/restoring your "firmware" or iOS.